The following photos are of the Roosevelt Lake area, located at the bottom of the great Tonto Basin, about 30 miles north of Globe. 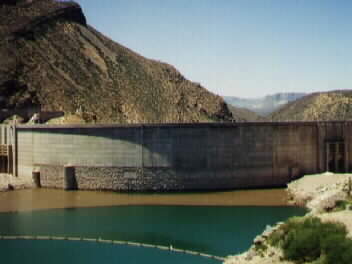 The original Roosevelt Dam was completed in 1911. The suspension bridge near the dam was constructed in 1991. The original Roosevelt Dam was built in 1911, but was raised in the late 1990s. 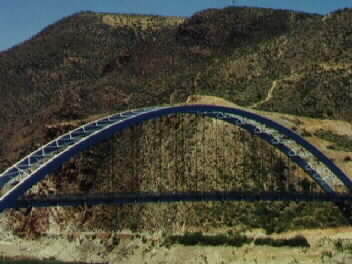 A view of the suspension bridge at Roosevelt Lake. 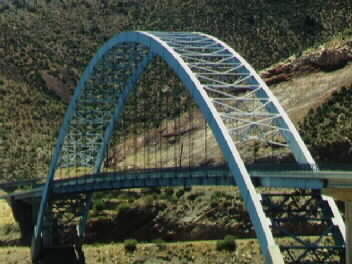 The bridge was completed in 1991. Another view of the suspension bridge at Roosevelt Lake. 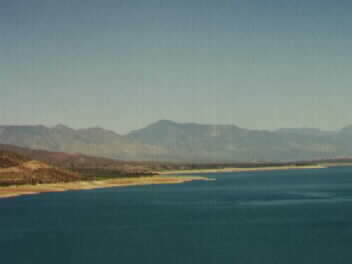 A view of Roosevelt Lake from near the dam, looking toward the north Mazatzal Mountains. 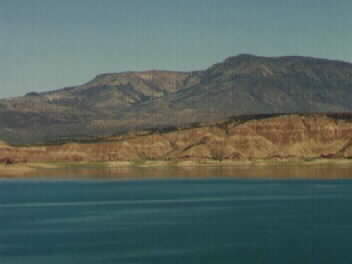 This is a another view of Roosevelt Lake, looking northeast to the north end of the Sierra Anchas. 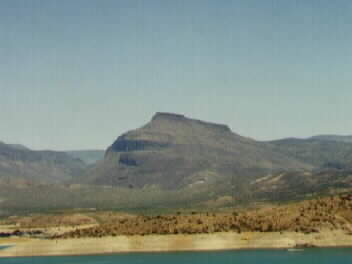 This is a view of Dutchwoman Butte, north of Roosevelt Lake. It is said that Al Sieber named this butte, as it "looked like a Dutchwoman leaning over her laundry work." After Al Sieber was killed at Roosevelt Lake on February 19, 1907, building a road north of the dam, a monument was made for him by his Apache laborers. The monument was originally located closer to the dam, but when the new bridge was built in 1991 it was moved further north. 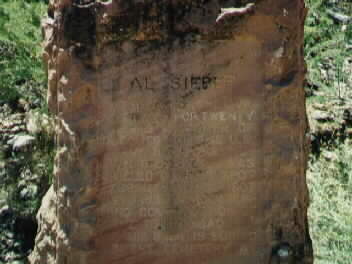 The inscription reads, "Al Sieber, veteran of the Civil War and for 20 years a leader of scouts for the U.S. Army in Arizona Indian troubles, was killed on this spot February 19, 1907, by a rolling rock during construction of the Tonto Road. His body is buried in the cemetery of Globe."